Implementing Kaizen 5S / 6S methodologies, using English and Te Reo Māori translations, is a great way to reduce waste and create efficiency at New Zealand businesses: “Big improvements can come from small changes which accumulate over time” . 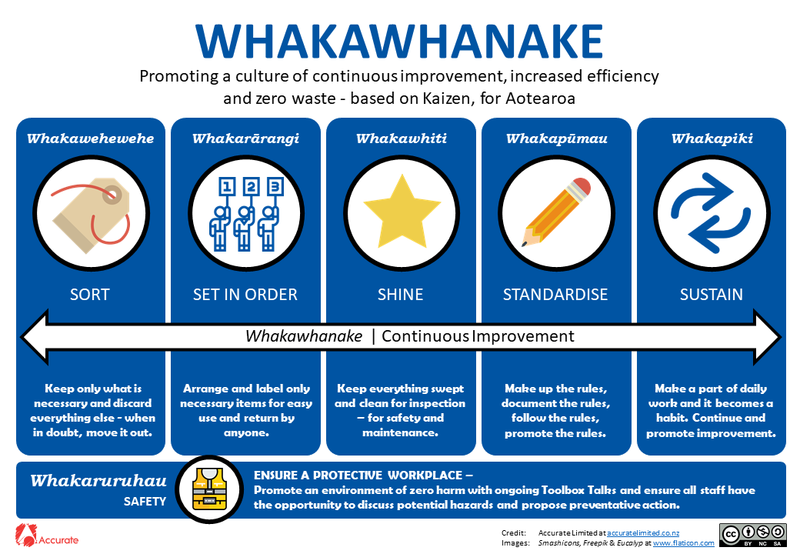 We’ve translated the 5S/6S methodology terms into Te Reo Māori and this workplace poster can be used to promote continuous improvement: Whakawhanake. The te reo translations of the steps used in this workplace organisation method more closely align to the original Japanese actions of seiri, seiton, seiso, seiketsu, and shitsuke rather than their English words. The addition of ‘safety’ as a component step is also included within the translation making this six actions. You can download the material below in PDF format and it is released under a creative commons licence. Whakarima Hear Example 5S A word construct to indicate “5 Whakas”. The process which excludes the Whakaruruhau/safety component. Whakaono Hear Example 6S A word construct to indicate “6 Whakas” including the Whakaruruhau/safety component. For further details regarding the terms used and the reasons for their selection, rather than other words, is available here. If you wish to purchase the original files and work for commercial purposes or to remove the credits, please contact us. Whakawhanake by David Nolan is licensed under a Creative Commons Attribution-NonCommercial-ShareAlike 4.0 International License. Permissions beyond the scope of this license may be available at http://www.accuratelimited.co.nz/contact/.